Bread & Butter: Paradiddles (2007) was part of the Bread and Butter warm-up packet from the old FatMattDrums, and I think it has aged well enough to deserve new life here. It begins with a simple paradiddle builder then works its way into some mixed-meter patterns with various degrees of grooviness. Mark time or don't... or just halt when things get tricky. Either way, this one should be a lot of fun! Slurred Ruff (2009) was used by the NC State and Athens Drive HS drumlines to work on tap sound quality between doublestrokes and single beats. Whether your doublestrokes tend to overpower the single beats, or vice versa, your ears will pick up on it. This warm-up doesn't actually have straight paradiddles in it, but the skills it hits are most related to the other paradiddles warm-ups. Timing-wise, one tendency seems to be (I don't know why; it's just what I've seen) to tighten up the ruffs on the all-tap bars: i.e. to play something like 1 &a2 &a3 &a4 &a on the single-height bars. A constant doublestroke motion on one hand must be maintained, whether the other hand executes a "buck" motion, or a rebounded "8 on a Hand" motion. The bass drum part is such that all the written notes could be played as a single unison part. 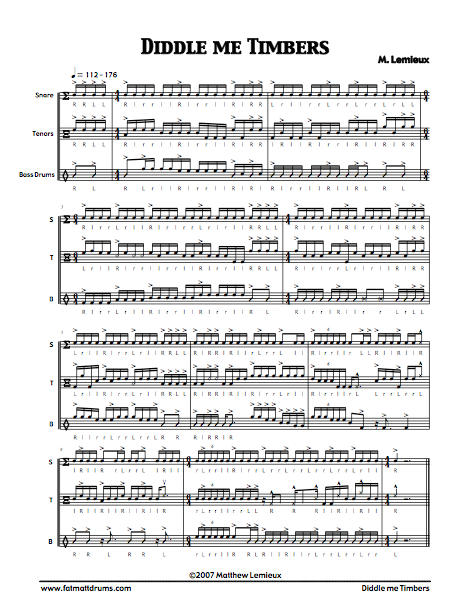 Paradiddle Flow (2009) is a simple warm-up that emphasizes 16th-note timing consistency within different stickings (puh-duh-duh, paradiddle, paradiddle-diddle, slurred six-stroke roll). Practice at a single height (i.e. all taps) will build comfort with the different stickings. Practice at different accent heights will build comfort with the downstrokes involved. Diddle me Timbers (2007) is a paradiddles warm-up with a little more variety than Paradiddle Flow. The double paradiddle rudiment makes an appearance here as well, so don't misread them as paradiddle-diddles. The bass drum part is such that all the notes with stickings could be played as a single unison part, leaving the notes without written stickings as a split. The bass line is then challenged as much as the snares or quads to perform paradiddle-related rudimental demands. High Five (2009) is an all-around doublestroke étude; double-beats, paradiddles, and rolls (slurred and straight) must be mastered in order to pull this one off. This piece is based on an onfield warm-up I wrote with the same name. The way it is constructed, isolatation and repetition of individual measures will be a useful practice tool in putting together this warm-up. This piece was first performed by the 2009 NC State Drumline. This one also has double paradiddles, so don't misread the stickings... I know people don't write those too often anymore. The bass drum part is such that all the written notes could be played as a unison part.